In response to rising demand for a dental education back in the late 1970s and early 1980s there was a large increase in the number of dental students matriculating in dental schools across the nation. Some of this was due to federal funding increasing the number of slots available. After a while, this led to what some called an oversupply of practicing dentists leading to a wave of unforeseen changes in the business of dentistry, namely the introduction of managed care dental plans and increased competition. 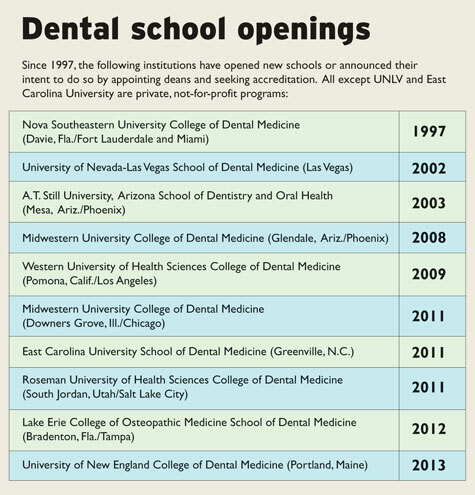 In time the cost to the schools of providing a dental school education began to rise and some, mainly private, schools began to close; schools like Northwestern, Georgetown and Emory. 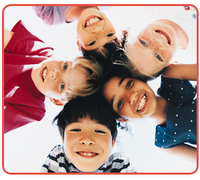 Recently there has been an increase in the number of schools opening or planing to open across the country. I do not know what long term effect this may have. It will be interesting to see what happens and how this might affect dental school admissions and graduates. One planned school at the University of Central Florida has been put on hold. I do hope these new programs will provide a great educational experience and not just become a profit center for the parent organization with little actual training or education for the students. 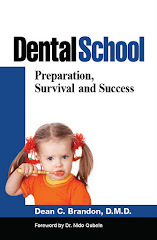 More information on Dental School can be found in my new book. It's really good to read that education in dentistry is going to increase. If awareness about dental health is also increase in same manner then, it will be more beneficial for our society also. 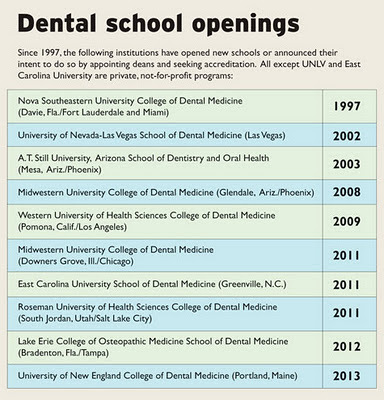 It's good that the number of dental school is increasing. It's a proof that many are interested in becoming a professional dentist who'll help in promoting good dental health in the near future. Two thumbs up for the future dentists on our place. This is great news. Lots of under served communities out there. I am happy for an increase of dental schools but until there is a better safety net with more incentives for the new dentists to help with the under served (more like those in place in New York state), these talented, under heavy debt, and intelligent doctors will gravitate to where the money is to help them get out from under that debt. As a public health dentist, I am interested to hear your personal opinion of the mid-level practioner which the Kellogg Foundation is trying to push. I feel that there are under-served communities like the population I serve but it is not the lack of practioners which limit the access to care. I live in a dentist dense area but I commute to an under served community and my income is a lot lower due to this decision. It is the lack of funding through the counties, states, and federal government which prohibit dentists like myself from being able to serve these populations without financially jeopardizing ourselves after our long and arduous (yet thorough and complete!) health professional educations. Many young dentists feel pushed to accept corporate dentistry contracts instead of the traditional privately owned office due to the financial weights and that alone is changing our profession. More schools will just place more competition for these spots. I can't even get loan repayment grants for my area and I serve only 200% below the poverty line patients driving from everywhere to come to our clinic and I'm booked till next year. But what will happen when these corporate offices get a hold of these lower paid midlevels with less training and abilities? We have all seen how not all dentists are created equal - can you imagine what it will be like if we lower the bar? These new dentists from these new schools, and subsequently we, will be feeling the crunch but the under served will still be fed to the dental corporate dollar sign. We, as dentists, will feel powerless to stop the decrease in quality and delivery to our "served" populations and will be even more powerless to help the under served since many dentists won't even own or control their own practice. So, I'm waiting to applaud the incoming dentists due to the fact that they will not be running toward the under served anytime soon but will be changing the game plan.